It’s all about green, white and gold today given the day that is in it, it feels like the right thing to do and an appropriate way to show support for our ‘boys in green’ as they play France in the Euros. This dish is another one to put on your list for your meat-free dinner day. It is easy to make as well as healthy, wholesome and really tasty as it contains a great combination of flavours. Many of the ingredients are ones that you can have in your store cupboard. Butternut Squash for example has a great shelf life – this particular one was in my vegetable drawer for at least a month! Feta cheese is also something you can have in your fridge as it has a long shelf life once unopened. To use the rest of a packet of feta you could make this Green Pea & Feta Cheese Omelette the next day. The other ingredients i.e. onions, garlic, sun-dried tomatoes in oil would always be staples in my kitchen with the only ingredient that I might need to buy being the fresh mint. While the squash is in the oven heat the oil in a pan and add the onions. Sweat over a low heat for 4-5 minutes until they are soft and translucent. 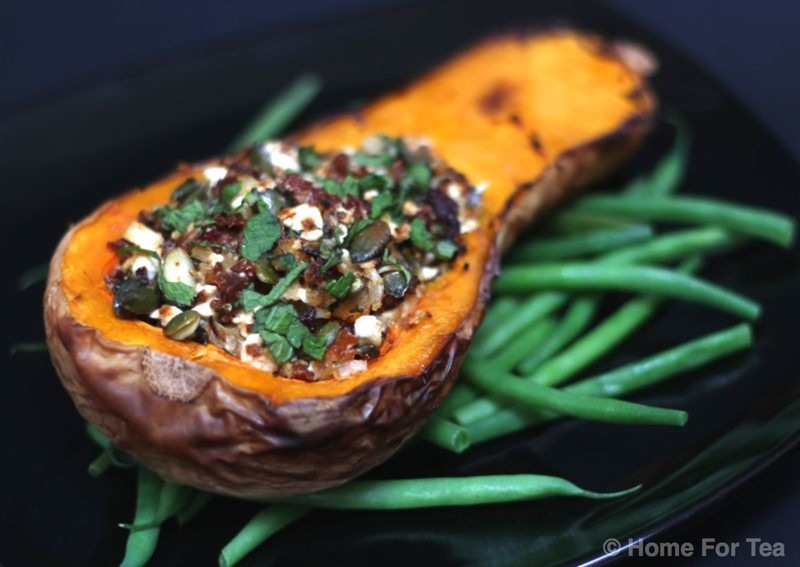 In a bowl, mix the sun-dried tomatoes, pumpkin seeds, crumbled feta, mint, cooked onions and garlic together. Remove the butternut squash from the oven when cooked and scoop out some of the flesh to make space for the filing. (Keep the flesh for another dish). 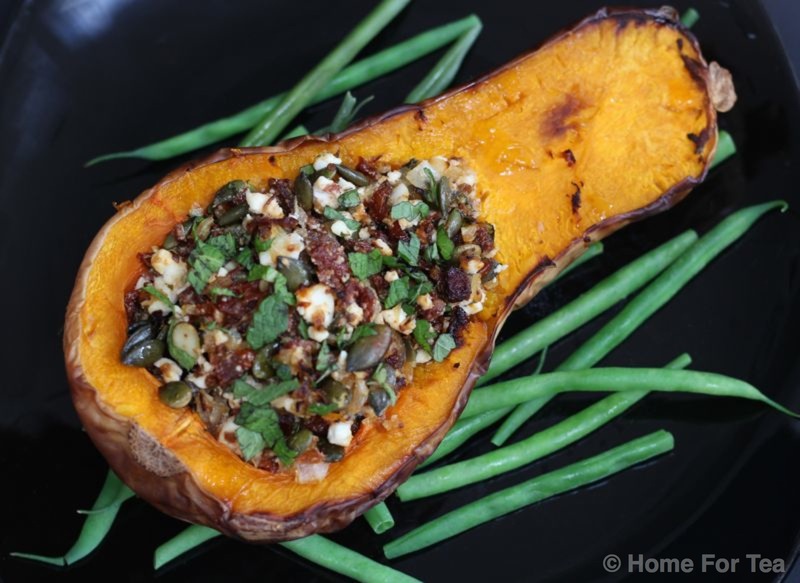 Fill the squash with the stuffing mixture, then return to the oven and cook for a further 10 minutes. Remove from the oven and serve with some green veg. PS – this reheats very well so you can enjoy it the next day as well !